Apple boldly claimed early this week that its refreshed 13-inch MacBook Air was "up to two times faster" than the previous generation of laptops and a teardown has revealed that it wasn't telling porkies when it made the claim. iFixit's teardown of the new 13-inch and 11-inch MacBook Air models included a speed test that revealed the respective read and write speeds of the two new machines as well as minute details on the memory inside each one. Using Black Magic's Disk Speed Test, iFixit was able to ascertain that the 11-inch model has average read speeds of 315Mb/s and write speeds of 668Mb/s, whereas the 13-inch model has average write speeds of 629.9Mb/s and average read speeds of 1285.3Mb/s - almost exactly double. The uplift in speed is thanks to the new PCIe-based flash storage inside the 13-inch MacBook Air and the subsequent teardown revealed it has used Samsung flash memory with a Samsung controller to achieve the speeds. 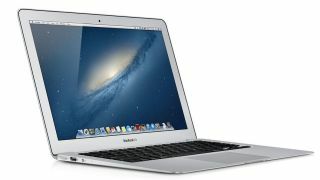 The 11-inch model, which has the slower memory, has SanDisk flash memory with a Marvell controller. Apple refreshed the line earlier on this week when it also released its smallest laptop ever in the shape of the MacBook, which controversially did away with all ports except a USB-C and headphone socket and has set tongues wagging throughout the tech space.